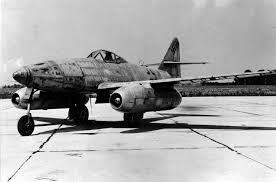 The Me 262 was one of the world’s first effective jet aircraft. Its airspeed far exceeded that of its piston-powered contemporaries, allowing it to attack and withdraw with relative impunity. When flown by experienced pilots, these aircraft were very effective, frequently achieving four-to-one kill to loss ratios. But it was too late to accomplish much against the gargantuan bomber flights pouring out of England.